The AMG E63 S Wagon went on sale in October 2017 as one of 22 AMG models in the U.S. that have standard all-wheel drive (out of a total 40 AMG variants). Although some of the well-known SUV models such as the G-Class, GLS, or GLE usually come to mind when referring to all-wheel drive, the E-Class Wagon has become synonymous for all-wheel drive capability, with a very exclusive customer base. The Mercedes-Benz E-Class wagon attracts one of the brand’s highest median household incomes, with 23% of its U.S. customers being located between the New York and Boston metropolitan areas, and 22% in California alone. For more than five years, Mercedes-Benz has been without German competition in this size and class. The 2018 Mercedes-AMG E63 S Wagon offers all the connectivity and Intelligent Drive functions of the E-Class sedan and wagon, including the available Intelligent Drive systems. It’s a roomy, family-friendly wagon with 35 cu. ft. (SAE) of trunk capacity behind the second row, and a 40:20:40 split rear seatback to maximize versatility. The heart of this special vehicle is a handcrafted AMG 4.0-liter V8 biturbo engine, in this application using twin-scroll turbos nested in the hot inside V between the cylinder banks for minimal lag and pressure loss. With an output of 603 horsepower and 627 lb-ft of peak torque, sustained from 2,500-4,500 rpm, the roar of the AMG V8 sound might not be family-friendly, but at least AMG Cylinder Management does its civic duty to help make an efficient engine even more efficient. All-new AMG multi-chamber air suspension with continuously variable damping ensures exceptionally high levels of camber stability, driving dynamics and steering precision. The air spring stiffness can be adjusted over a wide range to enhance comfort and handling, and the spring rate stiffens automatically to reduce roll and pitching in response to sudden load changes, fast cornering, hard acceleration or heavy braking. The full AMG cabin treatment includes an exclusive version of the E-Class’s dual-12.3-in. screen digital instrument cluster offering selectable “Classic,” “Sport” and “Progressive” display designs. Gauges in a carbon-fiber look and distinctive typography lend the displays an especially sporty touch. An AMG Performance Steering Wheel in black nappa leather is standard, and for maximum occupant grip, AMG Performance Seats with integrated head restraints are available. Additional exclusive touches include nappa leather trim for the dashboard and door beltlines. While AMG made a version of the 210-series E-Class wagon for select markets around the world, it was not imported to the U.S. This undoubtedly disappointed potential customers until the 211 successor model arrived in 2005. Major change came to the S211 AMG E-Wagon for 2007. The new “E63” badge denoted an all-new 6,208cc naturally aspirated V8, the first engine completely developed by AMG for its own vehicles. Horsepower rose to 507 vs. 469 for the previous E55, although torque was 51 lb-ft lower at 465 lb-ft. The new engine was paired with a seven-speed automatic transmission with paddle shifters. 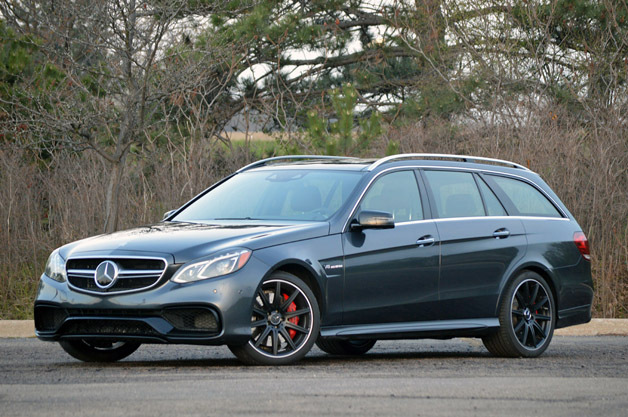 According to Car and Driver testing, the E63 Wagon did 0-60 in 4.0 seconds and the quarter-mile in 12.5-seconds at 115 mph. The new, naturally aspirated model was marginally quicker than the previous “Kompressor” in all tests. The top track speed remained electronically limited to 155 mph. The base MSRP in 2007 was $85,400. After a two-year hiatus, the E63 Wagon returned to the U.S. lineup in the angular new 212-series body and with major mechanical changes. A new 5.5-liter biturbo V8 replaced the naturally aspirated 6.2-liter engine and it remained a rear-wheel drive vehicle. The engine offered 518 hp and 516 lb-ft of torque, and an optional AMG Performance Package that raised that to 550 hp and 590 lb-ft of torque. Motor Trend measured at 3.9 seconds, despite company estimates of 4.1 seconds. However, its exclusivity remained in place with special-order status and a starting price of $91,500 (excluding destination/delivery charges), with 209 sold for the 2012-2013 model years. Available options included the Driver Assistance package that bundled active blind spot monitoring and lane-assist functions with DISTRONIC Plus adaptive cruise control with Steering Assist. The S212 E63 S AMG 4MATIC Wagon remained a special-order model, with initial sales temporarily increasing by around 800% due to standard 4MATIC all-wheel drive, especially for northern markets. A total 783 E63 S AMG Wagons were sold in the U.S. over the 2014-2016 model years.